One of the challenges of building a complete shower system has bee "How do we construct a barrier free shower?". Throughout the years his has been one of the more challenging areas of construct and design that we face as builder and tile installers. The first solution then, is to build a ramp, but this may not be viable as it may be an obstruction for physically handicapped users in a wheel chair, also making it difficult to tile over its edges left and right. The second solution that may come to mind then is that the shower area can be recessed into the subfloor. This will definitely be an option but there are many drawbacks to this solution such as: do we have adequate space to even make this possible? Is the structure able to be modified to accept this process? Etc. Once we have prepared a job for a recessed installation we now have to realize that, with the absence of a curb, waterproofing from the shower area into the area under the tile in the area close to the shower becomes important. And whatever waterproofing product or method is chosen should be able to safely connect the pitched waterproofing layer of the shower area to the waterproofing layer on the even floor area surrounding the shower. Supposed that these layers will be installed over pitch and plane area and over different substrates, they must be durable enough to deal with exposure of different movement coming from two different substrates and/ or materials. Especially at the transition between pitched and even area, this connection must be strong. In April of 2015, we introduced the newest product to the wedi line and it is the wedi Fundo Ligno. For those that are new to the wedi line of pre-sloped shower bases, a typical wedi pan has a perimeter thickness of 1 ½” and select pans with either offset drain or an offset linear drain, the perimeter thickness can vary to accommodate the ¼” per foot slope that is built into our products. The big difference? The perimeter of the Ligno will only be ¾”. We were able to create this product, which maintains a slope of ¼” per foot, by modifying the drain on the backside of the pan to be able to support the needed thickness at the center of the pan. By strengthening and widening the drain support underneath, we have been able to bring this fantastic new product to you and provide you with all approvals per building and plumbing codes with full ICC Approval. The drain body that wedi employs has not changed, just a few minor details on the installation process. How are we able to achieve this for you and how will this keep me from cutting into my customers structure you ask? Let me explain. The ¾” plywood subfloor will be cut away to the size of shower to be installed. At this point, blocking will be required to support the new sub-floor that we will create. If you will be waterproofing the main floor with our Subliner Dry sheet membrane and no further underlayment below ( i.e. cement board), added 2”x4” or 2” x 6” blocking will be attached to the joist ¾” below the top of the joist, on all four sides of each joist cavity essentially giving the new recessed subfloor and Ligno base full structural support under its perimeter especially. The Plywood , in smaller sheets, is now re-installed on top of the blocking and thus flush with the top of floor joists. Optionally, if you will be using our ¼” Building Panel for waterproofing or cement board plus Subliner Dry sheet waterproofing membrane on the bathroom floor then you will install your blocking for example only ½” below the joist letting the Fundo Ligno stick out from the recess so it can connect flush with its channel and top to accommodate a connection to a higher floor build up or underlayment products chosen. Once the blocking is installed at the right height and in place, the next step will be to install ¾” plywood on top of this blocking to create a new subfloor that is in that case a bit higher than the top of the floor joist putting Ligno at the right height to connect with wedi Building Panel or cement board and Subliner Dry waterproofing. In this case where the plywood strips are set higher than the floor joist, furring strips are added over the floor joists to get flush. So there are many options to provision for connection of the Ligno base to flooring underlayments offering different build up outside the shower and this flexibility to go to flush floor ground zero or build up higher as needed is valuable. Once the new subfloor in the shower area is in place, a hole will be cut into the subfloor with a diameter of 6 ½” to accept the backside of the drain and your 2” pipe will be cut 5/8” below the new subfloor. The drain connection itself has not changed, you will use the same compression fit drain connector as you have used in the past. 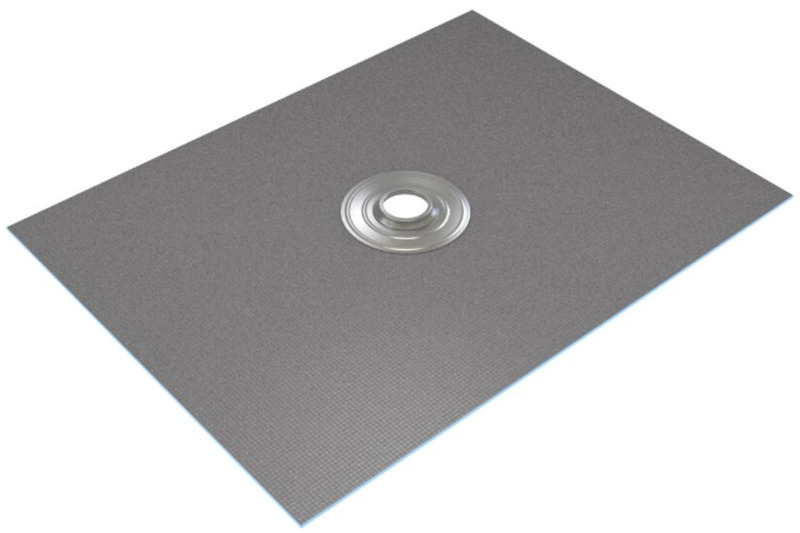 When employing the Subliner Dry as your method of choice for waterproofing the main floor, a simple overlap onto the pan of 4” is all that will be needed and the membrane is flashed up against a wall by about 2-4 inches where applicable. When using the Building Panel, it will join into the notch that is on the pan and wedi joint sealant seals and connects the notch channel and building panel. Where the notch channel(s) is not used (e.g. where sheet membranes are used instead of wedi building panel) it can be filled by sealing in the “channel protection strips” made of wedi building panel. They come in every Ligno box to protect the thin channel in transit and handling. Once done, the membrane is thin-setted right over the channel and reaching into the Ligno base. 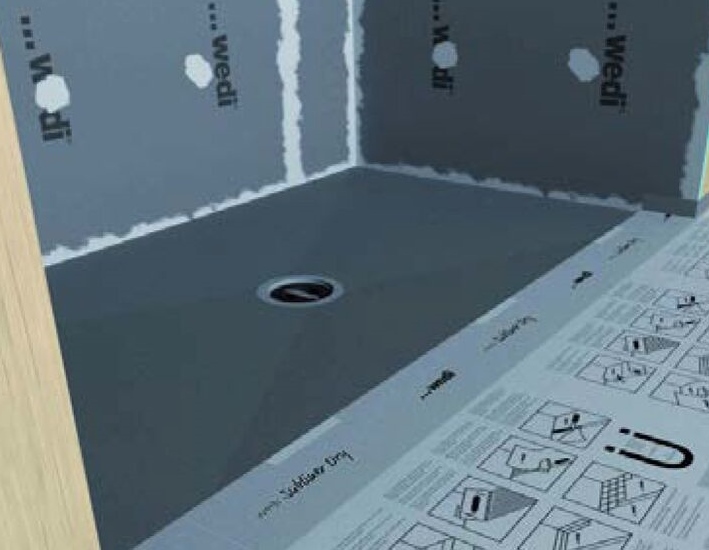 The Ligno base has the wedi typical notch channel to also allow for the insertion of wedi building panels, used as your wall backer board, in a bead of wedi joint sealant. And wedi Ligno can be modified in the same fashion as our other Fundo bases. The Ligno will be able to be cut back up to 6” on any side so there is room for modification, although less than what you have come accustomed to on our full line of shower bases. Please be mindful to not cut off more of the base as you will lower the height of the sloped base and a floor flush recessing might become increasingly difficult. The Ligno, as with our entire Fundo shower system family of products, of course is made for tile and stone. Its strong, reinforced cement based coating offers not only the option to walk over the base and work on it without adding protective plywood- it also is made to offer great adhesion to any cement based type of thinset mortar adhesive. Add into account is light weight (easier on the structure and on your back), its insulating properties (keeps tiles warmer), internal waterproofness, and you can sell your customer a great added value installation. We are excited to bring you our new Ligno system and trust you will enjoy many great installations around the Ligno. We constantly thrive to introduce new products to you which address your installation needs and are engineered to overcome traditional challenges in construction, so that you can build your shower business on one brand, one complete system, one warranty that you can trust. We hope that wedi Fundo Liquo can be a successful part of your business. Please feel free to contact your local Technical Sales Support Manager (TSSM) with any questions that you have about availability or technical questions on this first shower system for floor even and barrier installation MADE for tile installation. Copyright © 2015* wedicorp, All rights reserved.